I prefer if my homemade tea bags look "pretty" but sometimes speed take priority. Here's how I make tea bags for loose-leaf tea in a jiffy, for 1/4 cent each. I use a basket-style paper coffee filter, the smaller size, bought at WinCo, or Dollar Tree, for about 1/2 cent each filter, and an ordinary stapler. Take one filter and fold in half. 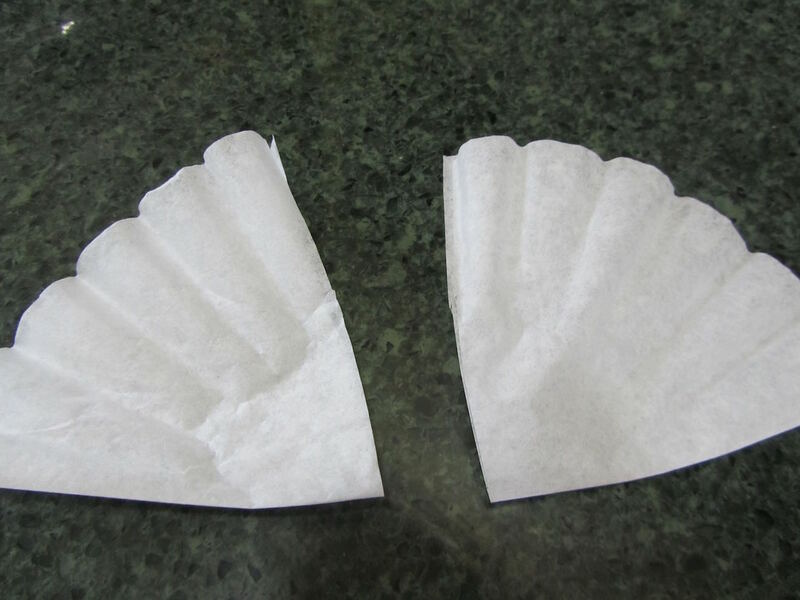 Cut the filter into two wedge shapes, and open each up. 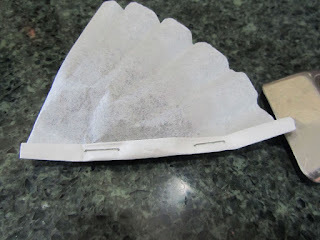 Place two to three teaspoons of loose tea on one side of an opened filter half. Fold the filter over. On the straight edge, fold the edge over once, then a second time, and staple shut. On the rounded edge, fold in two sections, over twice each section, and staple shut. 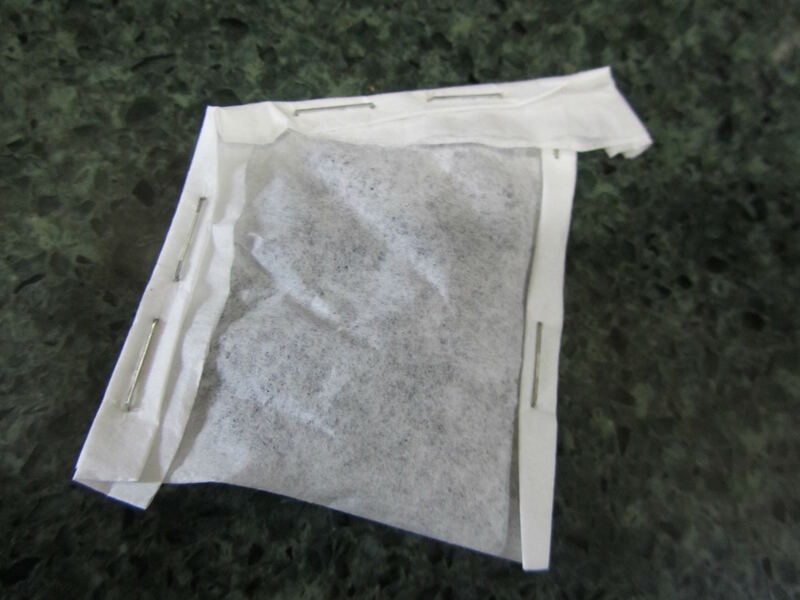 There you go, one pre-filled tea bag for use with loose-leaf tea. They're not pretty, but very functional, require no sewing skills, and can be made in about one minute. I make a few at a time, for the same ease as commercial tea bags. I know, I could use tea balls, and I do. Sometimes, though, I'm too lazy to wash them out. Cheers! I remember your sewed ones. This is more my style. I'm not a big tea drinker and have lots of tea in the cupboard that I have received as gifts still to be used. However, this tip may come in handy sometime in the future. The sewed ones look prettier, and I use those when making gifts of tea bags. But if I'm in a hurry this really works. 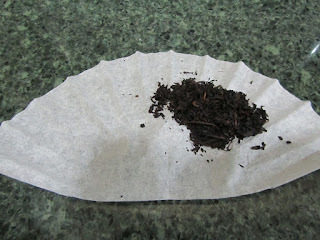 I'm not as thrifty as you, but do find pretty good deals on unbleached tea bags on-line for the home-made teas I make. If anyone else here buys those, I just discovered a faster way to use those. I misplaced my stapler the other day, and needed to close up a tea bag. I was looking for something convenient in the kitchen to use, and I found that I could fold the bag twice and skewer it closed with a toothpick. Great idea using the toothpicks! Good to know, about boiling the bags, too, Sara! Is the tea enough for a cup or a pot? I have never measured my loose leaf tea--I just dump it in the tea ball. You are right about not wanting to wash the darn things out--I hate that job! This is also a nice idea if you want to take tea with you while you are traveling or out and about. We watched the third installment of Victorian Slum House last night. I like how the program goes through the decades and shows the different challenges each decade brings. 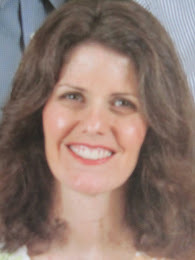 Just about when you think you've got something figured out, new challenges come along ... not so different from now, really, except their life was much more stark. I like strong tea, so close to a tablespoon is what I like. 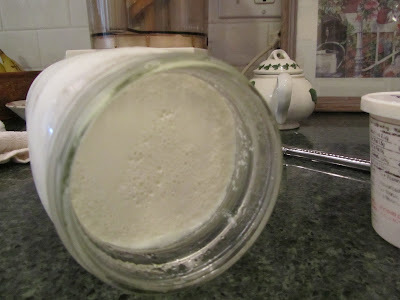 Most people probably use about 2 teaspoons. These pouches, with this size coffee filter make a single-cup tea bag. 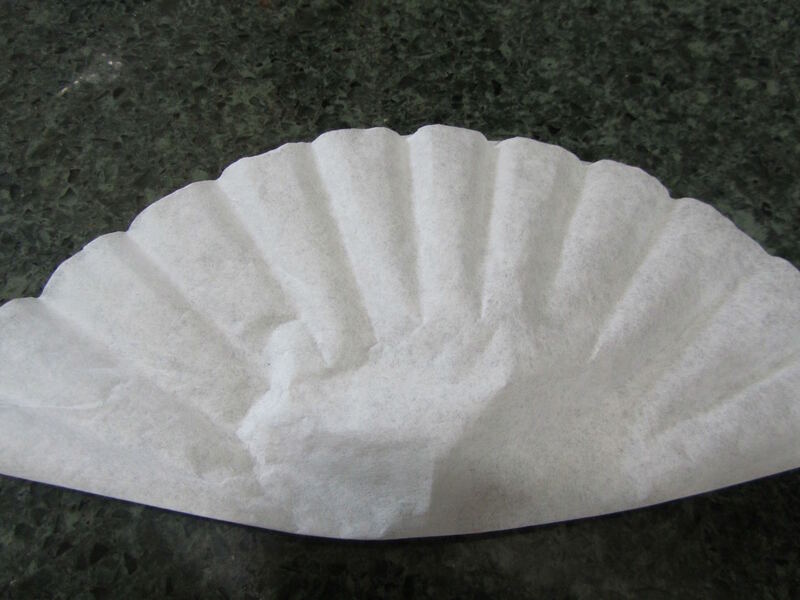 I think if someone wants to make pot-size bags, then those larger basket filters would work (the ones for a coffee maker that make 6-8 cups of coffee. I'll watch Slum House later today or evening. That is an interesting parallel to modern times. Just when I think I've figured out how to manage our budget, something major changes, and I have to refigure everything. I'm bad..I just buy teabags. Some are tagless and and pretty cheap and some have tags but not too expensive either. I have looked but I can't even find loose leaf tea. Oh, well, any way you make a cup of tea is delicious!